Today Raphaella Smits is world renowned as a talent of extraordinary dimension for her most sensitive and inspired musicality. She is called quite rightly ‘une Grande Musicienne’ and ‘one of the most delicate and most cultivated performers of our time’ (Jean Bernard, Diapason, FR).Raphaella Smits plays in her unique way on eight-string guitars. Her tours have taken her to over 30 countries and some of the most important musical centres in the world. More recently she has also developed a passion for early instruments to achieve authenticity. Recognized as ‘an uncommonly musical guitarist’ (Tim Page, New York Times), she always commits to the soul, the essence of music. Her solo recitals as well as her performances with the most distinguished colleagues always meet enthusiastic audiences and press. Concert-goers everywhere are in awe of Raphaella’s captivating stage presence. Besides stage-work Raphaella Smits has made 16 successful albums (including 11 CD’s for Accent Records), many of them being listed as indispensable to refined music lovers. Besides she participated in the recording of 10 anthology albums. 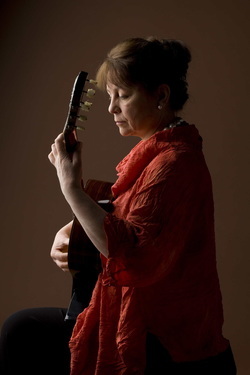 Raphaella Smits is internationally praised as a teacher for both guitar and chamber music. In addition to her chair at the prestigious Lemmens Institute in Belgium, she regularly gives master-classes in West and East Europe, in North and South America and in Japan. Organizers of international music competitions ask Raphaella as a member of the jury because of her ability to listen and to judge so accurately. Here again she shows her talent for combining professional skills with a great sense of empathy and correct judgement.